KawaiiPunk - Kawaii Mascot Blog: Happy 2nd Birthday! As this month marks the 2nd anniversary of the KawaiiPunk Blog, I though I would create a piece of art to commemorate this remarkable and highly surprising achievement. After all, I never thought anyone as nerdy looking as you could keep a blog going for so long! No offence! Anyway, I thought long and hard about what to create, and in the end decided on a paper diorama of a KawaiiPunk kawaii mascot party! 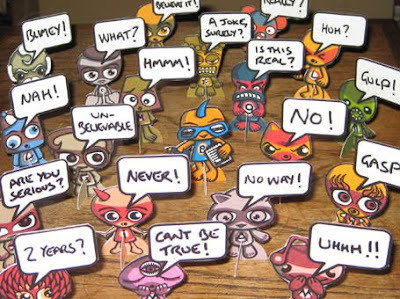 As you can see I have placed you at the centre of the diorama, and have surrounded you with your fellow mascots - all of whom are expressing their disbelief at your 2 year blogging achievement. Again, no offence! Anyway, I hope you enjoy this artwork, and I also hope you continue blogging for many years to come. Although obviously, given my doubts about your blogging prowess, I won’t be holding my breath for this outcome! Wow! Thanks Frank! What a great piece of art! And don’t worry about causing offence - I can’t believe this blog has been running for 2 years either! It seems like much longer!